Property Details: 2 Bedroom, 2.5 Bathroom Vacation Rental, sleeps up to 6. Casa Caribe Townhome, beach resort home in Key West. Tropical 2 bedroom, 2.5 bathroom, 2 level Key West townhome to be your home away from home! No detail has been overlooked in this comfortably decorated vacation rental. Located in one of the islands newest gated community’s, Coral Hammock, you are close to all that Key West has to offer. On the first floor, the kitchen is vibrant with fresh white cabinetry. Full kitchen appliances allow for either complete at home dining or even for quick and easy meals. Ceramic tiles cover the first level, giving you a classic Key West look. There is also a powder room on the main floor for convenience. The second floor leads to the two main, airy bed and bathrooms. There are dual masters on either side of the home, separated by an in house laundry with a new washer and dryer, keeping you fresh and lightly packed while on vacation. Both masters have spacious bathrooms, which are tastefully decorated with bright accessories, mirrors and lush textiles. If you’re looking to kick back and relax in a homey atmosphere, Casa Caribe is the place for you! 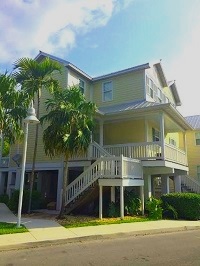 Casa Caribe Townhome Rental in Key West FL.